Latest figures from the UK and Ireland suggest that sales of compatible Canon CLI 526 ink cartridges are out performing their original brand counterparts by two to one! Bearing in mind the extortionate prices that are being charged for the original brand ink cartridges it’s hardly surprising that many people have switched to using the compatible version. Printing has become a growing expense in the office and at home (it’s estimated that the average family now has at least 2 home printers compared to one or no printer at all 5 years ago). In the past the quality or reliability of the non-original cartridges may have been an issue but with the compatible cartridges now being manufactured to the same ISO standard there is virtually no difference at all. The compatible Canon CLI 526 ink cartridges are ideal for everyday general purpose printing and come in packs of 5 cartridges; CLI 526 black, CLI 526 cyan, CLI 526 magenta, CLI526 yellow and PGI525 black. As with the original brand, the beauty of using the Canon compatibles is that you only have to replace one cartridge at a time as and when the ink runs out. 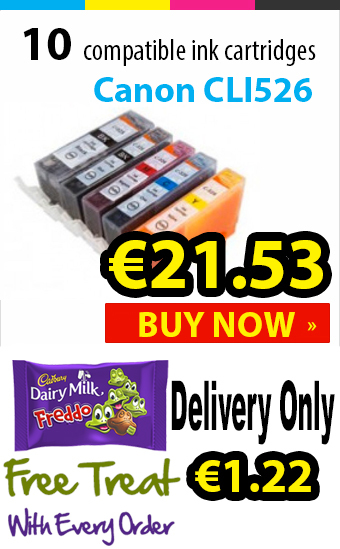 The cartridges are available to buy online for as little as €1 each plus VAT and come with low cost next day delivery across Ireland and the UK. Compatible cartridges in general are becoming more and more popular for both inkjet and laser toner printers. Savings gained by using compatible inkjet cartridges can be as much as 100% when compared to the original brand and this can make a huge difference to the print bill for the home user or small business. These small home printers are ideal for everyday printing such as school home-work and boarding passes and very rarely give any issues with the non-original ink cartridges. Using high quality compatibles ink means also having the advantage of the cartridge holding more ink so not only is the cost lower but you are able to print more pages as well. It’s possible to purchase one of Canon CLI-526 printers for under €80 online and when combined with using the compatible ink cartridges the printer becomes very good value indeed.